What a registered dietitian wants you to know about all those "milks" in the grocery store. Though non-dairy milks have been around for a while, they’ve recently experienced soaring sales and enormous popularity — due, in part, to environmental concerns, dairy issues (from allergies to lactose intolerance), and just general interest in dairy alternatives. From the variety of base ingredients to the assortment of flavors, there have never been more knock-offs to choose from. But if the number of choices has left you udderly confused (see what I did there? ), here’s a quick guide to help you navigate the dairy and non-dairy aisle. Most non-dairy milks are compared to cow’s milk, which has a strong nutritional package. Cow’s milk contains 8 g of protein — more than a hard boiled egg — along with 300 mg of bone-building calcium and 400 mg of potassium, a nutrient that’s lacking in most Americans’ diets. It’s hard to argue with the spectrum of nutrients in milk, unless of course, you have lactose intolerance (which causes troubling symptoms, such as gas and bloating) or a milk protein allergy. Speaking of lactose, the 12 g of sugar listed on a milk label are all from this natural sugar. Milk itself comes in many varieties, from fat-free (skim) to whole, organic and lactose free. I generally recommend 1% milk since as the percentage goes up, so does that saturated fat. That said, if you’re otherwise healthy and consuming mostly good fats from foods like avocados, nuts, olives, and oily fish, I’m less concerned about 2% milk. As far as organic goes, it’s a term that refers to the farm’s sustainability and management practices. 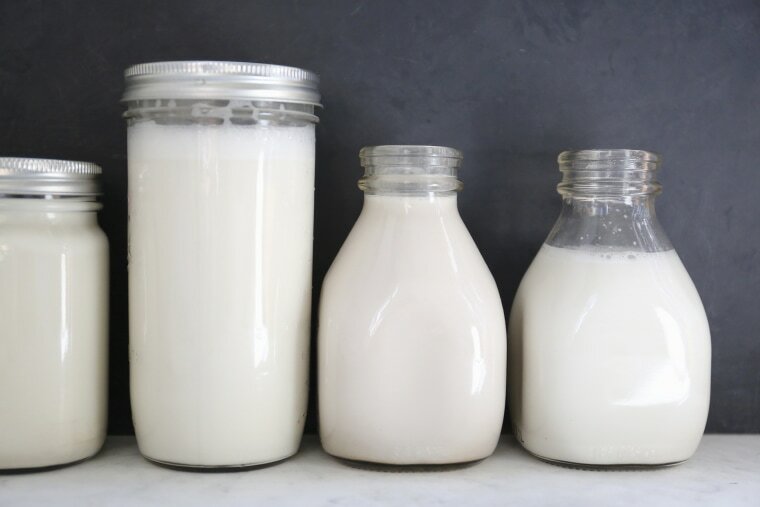 Though I choose organic milk for my home, organic and conventional milk have the same nutrition and safety profile, so deciding between the two comes down to a personal choice. Tasting notes: Ranges from a little thin and watery (fat free) to luscious and rich (whole). In the non-dairy milk wars, soy milk was just declared the winner, according to a new scientific review of four plant-based milks. Unlike its competitors (almond milk, coconut milk, and rice milk), soy packs the same amount of protein as cow’s milk, giving it the edge. Newer plant protein milks (made with pea protein) weren’t included in the study. For those allergic to soy or who have other soy-related concerns, these milks are a good, protein-rich option. Though there was once a worry that soy foods raise the risk of certain cancers, the most recent evidence doesn’t support the association. Tasting notes: The 6 g of added sugar masks the slightly beany flavor. Overall, the creaminess is in line with low-fat milk. Unlike its competitors (almond milk, coconut milk, and rice milk), soy packs the same amount of protein as cow’s milk, giving it the edge. With less impact on the land than almond milk and more protein than soy or cow’s milk, milks made from pea protein have a lot to love. For those seeking the hunger-busting power of protein, this drink has 10 grams per cup. Tasting notes: Creamy, smooth, and clean tasting. Coconut Oil: Health Hero or Dietary Disaster? Unlike soy, milk, and nuts, which are among the top eight food allergens, rice is very well tolerated, making rice milk a great option for those whose choices are limited. My family turned to rice milk when my son’s food allergies necessitated it, and I’m thankful products like this exist. That said, though it’s made with brown rice, it’s actually quite weak on nutrition, with nearly twice as many carbs as milk yet hardly any protein. I’m also concerned about arsenic in rice, particularly for infants and pregnant women. Though I still enjoy rice and rice products, the FDA advises varying your grains to limit arsenic exposure. That means if you’re drinking rice milk exclusively, look for crackers, cereals, and side dishes that have other grains, such as quinoa, oats, or sorghum. Tasting notes: Watery and somewhat sweet. Like rice milk, oat milk is generally well tolerated, making it suitable for people with food allergies and intolerances. Unlike other non-dairy contenders, this beverage boasts soluble fiber — the kind that helps lower cholesterol. Still, you get more of these beta glucans in a cup of oats than you do in oat milk. Tasting notes: Similar to the milk left over after a bowl of Cheerios—in a good way! Almond milk is the darling of the non-dairy milk world, probably because almonds themselves are deserving of nutritional praise. With protein, fiber, calcium, vitamin E, and healthy monounsaturated fats (MUFAs), almonds have a lot going for them. But the milling and processing means that a lot of that goodness doesn’t end up in the drinkable version. Almond milk does not have the healthy fats, protein, and fiber that you’d expect from this nut-based beverage. Plus, it isn’t appropriate for those with nut allergies. Tasting notes: Lightly sweet with a very slight nutty flavor. You may hear mixed messages about coconut milk because of its high saturated fat content. Cardiologists generally recommend avoiding saturated fat in favor of monounsaturated fats from foods like almonds and olive oil. However, the type of saturated fat in coconut milk is probably more neutral than harmful so if you’re avoiding other prime sources of saturated fat (such as whole milk, cream, cheeses, and fatty cuts of red meat), and are eating lots of produce, adding coconut milk to coffee and other foods is probably OK.
Tasting notes: A definite hint of tropical coconut flavor. The latest nut-based milk is made from peanuts and is in fact labeled “milked peanuts." According to the manufacturer, the distinction is in the minimal processing, a fact that allows this beverage to keep its creamy consistency without added thickeners and stabilizers. It’s been reported that almond milk is made with very few almonds, but the newest nut milk boasts 31 peanuts per cup. These sips are obviously not suitable for anyone with a peanut allergy. Tasting notes: Creamy and very peanutty. You may find that different needs and eating occasions call for different varieties of milk. Just as I stock quinoa, brown rice and other wholesome grains, I stock dairy milk, almond milk and pea protein milk at home. Whether I’m lightening my coffee, making overnight oats or adding creamy texture to soups and sauces, each serves a different purpose. Overall, there are a few things to keep in mind when buying a milk alternative. Watch out for added sweeteners in flavored varieties. Even original varieties may be sweetened so it’s important to read labels. Be sure to shake it. Calcium may settle to the bottom, so give it a quick shake to ensure your pour provides this mineral. Also note that the calcium added to foods is different from the calcium that is naturally occurring. There may be differences in how your body absorbs it, and it may not have the same health impact as the mineral found naturally in whole foods. Research is still underway, so be sure to also include foods, such as yogurt and cheese (if dairy isn’t an issue), broccoli, and almonds, that are natural sources of calcium. Non-dairy milk does contain additives. Additives like guar gum and tapioca starch are ingredients often added to plant-based milks to give them the creamy body that milk has. These thickening agents are generally recognized as safe, but another thickener, carageenan, may be linked to inflammation according to some research. When it comes to recipes, all milks are not created equal. You can cook and bake with non-dairy milks but the results may vary. Manufacturers often give cooking tips and recipes on their websites so check there ahead of time.